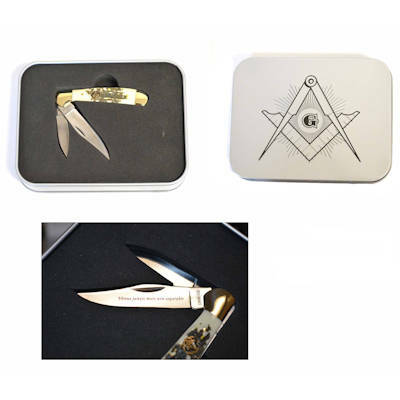 This Masonic Pocket Knife has two blades. The larger blade has the Latin Motto: Virtus Junxit Mors Non Separabit, which means: Whom Virtue Unites, Death Will Not Separate. The case is a white finish and a Square & Compass embedded in it. The knife comes in a grey tine case with a Square & Compass n the lid. This make a great gift.